Sunday Brunch Dress Shop run by the lovely Judy features the most adorable artwork of guinea pigs. 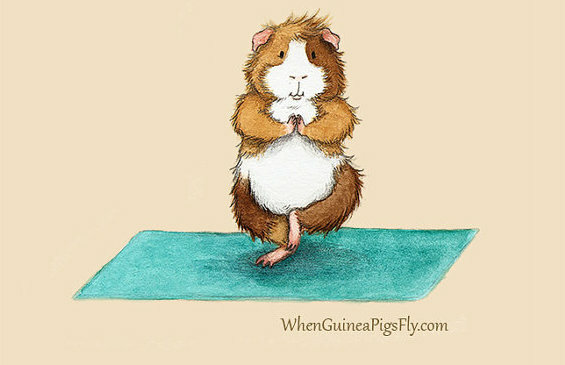 I am totally this yoga guinea pig. Carrie Fisher aged.. as all humans are apt to do, even MEN. How is this a difficult concept to understand? I have been lusting after Miss Fisher’s wardrobe from the TV Series and… my dream has come true. This is a crazy stroke of luck.. or just incredible. A house for $100,000 was later discovered to have been designed by Frank Lloyd Wright. Look fantastic in every photo with these 6 tricks. I blame Revanche for making me want these Hello Kitty Street Fighters. So cute, but so unnecessary for my #minimalist life.. Hello Kitty CHUN LI. Seriously!!! I agree. Could the men in our lives please step up and start pushing the issue for us too? It’s “parental leave” not “maternity leave”.. just the language alone makes a big difference. Stop making it an issue for mothers and women. It’s an issue for companies to be held accountable for, and for the men who make up the majority of said companies in leadership roles. Extremes in savings definitely make poor examples. I am one of those extremes and I know it. Trying to be fair and cognizant of that when I blog. As a Mommy, this breaks my heart. I feel terrible for all the expecting women in Brazil. Oh, thank goodness that Miss Fisher collection is limited to jewelry and bags. If hats and coats were included, I would be in trouble. COATS. Coats would kill me, I agree. I’m horrified by what’s happening in Brazil. I couldn’t even imagine. We still have illnesses that are carried by mosquitoes here, it’s almost impossible to avoid the mosquitos when they’re out, and I live in a reasonably dry climate! I can’t even imagine the terror those pregnant mothers must be going through.